It became somewhat difficult to recommend the GeForce GTX 980 graphics card when faced with the considerable value offered by its smaller brother, the GTX 970. With ostensibly the same GPU powering both cards, albeit in a slightly stripped-down version for the GTX 970, we reckoned that only die-hard enthusiasts would pony up the extra 60 per cent cash for the full-on GTX 980. Such sentiment was before Nvidia was found being liberal with the truth when it came to discussing exactly how the GTX 970 memory was arranged. Using some clever engineering tricks that circumvented switching off large parts of the GTX 970's backend has meant that only 3.5GB of the 4GB framebuffer works at full speed. It's a minor issue in the big scheme of things, but GTX 970 may not be quite as futureproof as the range-topping GTX 980. So any enthusiast wanting an unfettered second-generation Maxwell GPU needs to look at the GTX 980 instead. And putting its name forward as the premier provider of GTX 980s is PNY. 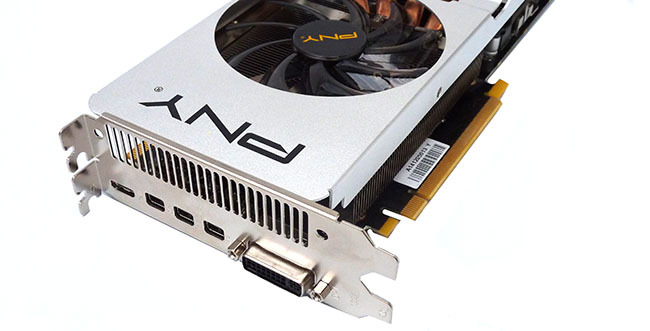 PNY has a number of GTX 980 graphics cards in its arsenal. There's the reference-looking model and a trio of Pure Performance models using custom designs and outfitted with faster frequencies. The fastest of the bunch is the GTX 980 OC2 Pure Performance, clocked in at 1,228MHz (1,329MHz boost) core and memory running at an effective 7,200MHz - meaning it is overclocked on both fronts. PNY has experimented with custom coolers by using, amongst others, Palit's Jetstream for select 700-series cards. The Pure Performance range uses a different, more aggressive cooler that's also seen on the company's various GTX 780 (Ti) GPUs. The OC2 version sits on a 280mm-long PCB that's totally obscured by an aluminium shroud that curves at the front. It's a good-looking card and certainly doesn't feel at all cheap. Two 85mm fans are active at all times, going against the grain of recent Maxwell-based cards, but spin at a maximum 1,000rpm when under no load and up to 3,240rpm when at 100 per cent capacity. A small cutout in the middle exposes the five thick heatpipes that make contact with the GPU via a copper core. There's subtle white lighting behind the fans though it's hard to see unless you specifically look out for it. The frequencies suggest this card is ripe for overclocking further, and PNY outfits the board with an 8-phase PWM supply - six for the GPU, two for the memory - which should, going by previous experiences, aid overclocking. Remember the average boost speed of 1,329MHz prescribed by PNY? As usual, the card far exceeds this, maintaining 1,420MHz across our games. Purchasing a high-end graphics card is almost as much about aesthetics as pure performance. PNY adds a well-built XLR8 backplate to the rear, more for show than substance, but it provides the card with an extra level of rigidity. Tipping the scales at 1,048g, this extra reinforcement may come in handy. Memory modules and VRMs are indirectly cooled by the two fans though PNY does take care and includes thermal pads between the behemoth of a cooler and all the hot-running components underneath. We appreciate that, although minor, PNY has indulged in some memory overclocking, up from the default 7GHz to 7.2GHz. Those of a cynical disposition can reasonably argue rival Palit has had a big hand in design: the rear backplate and, as you will see a little later on, video outputs are identical on both cards. The base PCB is also the same, meaning an 8+6-pin power setup, as is the aforementioned memory overclock, yet it's important to remember that PNY clocks its premium card in at a higher core speed. Dual SLI fingers are available for multi-GPU configurations. There has however been a bit of jiggery-pokery in the output department. PNY keeps the five default ports - DVI, HDMI and three DisplayPort - but the latter quartet have all been downsized to mini connectors. This configuration does aid the cooler - the upper half of the I/O panel is dedicated entirely to ventilation - but if you decide to attach up to four concurrent displays, mini-to-full adapters are likely to be required and there aren't any included in the box. PNY's recently-announced card is set to retail for £500 when it hits UK shores in a week or two's time. Such pricing is consistent with the very best GTX 980s from the competition, but, inevitably, is significantly more expensive than Palit's £420 Super JetStream. A card that ticks all of the technical boxes but is heavy on price. Is the GTX 980 OC2 Pure Performance still worthy of recommendation? Let's find out.